Are you are a real estate agent looking for some new ways or marketing channels to attract your future lady investors? Social Media Platform Pinterest is definitely the next tool you can rely on. In this article we will share how real estate agents can use Pinterest to get the most of it, to gain as much as interested ladies investors as possible. But first, let’s start from the very beginning. First of all, Pinterest is a visual bookmarking tool, where each user has an opportunity to pin (photos and videos) on virtual boards, so-called “Pinterest Boards”. When one photo or video is pinned, other users can “like” the posted pin, comment on it or re-pin to their own Pinterest board. So, on Pinterest it’s all about visuality and any real estate agent can provide to the power of using images in their online real estate marketing. Today, Pinterest represents the fastest growing site from all social media networks including, Facebook, Twitter, LinkedIn etc. In a February report, eMarketer announced that Pinterest’s user base in the United States would be 47.1 million monthly active users this year, rising to 59.3 million by 2019. Amazingly, Pinterest has gained much more and exceed these projections. In September 2015, vast of media such as The New York Times, Huffington Post, and Marketing Land announced 100 million active monthly users on Pinterest. Lately, the same information was officially confirmed by Pinterest. Understanding the average user on Pinterest can help you share better content for engaging your followers and collaborators. The site B2C has announced that 80% of Pinterest’s audience are women, where 45% are between the ages 24 and 45 with a six-figure annual household income in July 2015. 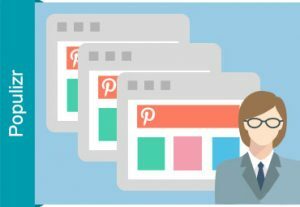 In this article, we will share how to use Pinterest to get to most interested ladies investors as possible. With an idea of the average Pinterest user, you can better target your real estate business to appeal to the most possible users. Whether you’re creating an individual board or a group board (we will explain how to create group boards on in the next point), you can target users by both demographic and interest. Having this in mind, the next step is to think of pinning only high-quality pictures of your pins and always include the link to your real estate website. For example, “Homes for sale” may be your Pinterest board where you will pin all your actual opportunities. Useful Tip: The title of your Pinterest board must be catchy, short and consist of interesting pins. Think of creating Pinterest board for each of the cities, towns, areas or provinces your real estate investors services for and highlight all the best and useful that might be seen around. This is how you will establish yourself as a local expert that can provide a different kind of information, pinned and placed to your lady-investors. A “Pinterest Group Board” is a virtual board where more than one user is allowed to pin on the same board. Group Boards are also known as – collaborative boards, shared boards, contributor boards, and community boards. The process of creation of a Pinterest Group Board is the same as when you create an individual board. The only difference is, in a group board you invite additional users to pin into the board. You can invite from your own connections or you can type in the e-mail of the users you want to join the group board. The first step to launching a Pinterest group board is to create an individual board and then to populate it with the best pins that are related to the board’s topic. This a great example of successful Pinterest Group Board named as “Pinterest Real Estate Group Board” which already counts 10552 Followers and 6.4K pins. Promoted Pins are part of the advertising strategy of Pinterest. For now, users that registered businesses accounts have an opportunity to promote their pins. Promoted Pins can be easily created by typing www.ads.pinterest.com. If you are not registered as a business on Pinterest, you will have to do so. Pinterest will practically offer you the opportunity in 3 easy steps convert to a business account. Promoted Pins are only available in the US and UK and business account holders can target Pinterest users in the US, Canada, and the UK. CPE Campaign: You can boost engagement with your Pins where you get charged for each engagement. Useful tip: If it’s your first time creating Pinterest ads, our best advice is to use CPC Campaign. With this campaign you will achieve two goals: Engagement of your pins and web traffic to your web page out of Pinterest. You can narrow your targeting and create promoted ads according to the interests of your lady investors based on their affinity for certain things, for example, home decor. With the use of keywords such as real estate investing, real estate investing rental properties, real estate investing flipping etc… you can reach an audience which in within search results types these keywords, looking for specific things to make, buy or do. Useful tip: Pinterest experts advise the use of one interest to be associated with a bigger amount of keywords per campaign. Pinterest ads dashboard is really easy to navigate. You can easily navigate even you are not a specialist in marketing with years of work behind. Pinterest has even created great pdf materials for dummies to create better campaigns and create cool pins with great advice inside. You can download them anytime from the dashboard. And last but not least, even you are on Pinterest for a certain period of time, you might still haven’t found a suitable time to do this simple task. Adding a Pin It button to your browser toolbar is quick and easy, so you can add pictures, videos at a moment’s notice. You can install the Pin It button in Chrome, Internet Explorer, Firefox, and Safari. Click HERE and follow the steps to add it to the browser you regularly use on a daily basis. As a real estate agent, you might be thinking that the best way is always establishing direct contact with your interested investor, followed by a previous recommendation. We cannot deny this for sure. But … Before you decide either you gonna implement it in your marketing strategy or not, make a research if the target that can be reached through Pinterest, and if it’s a good fit for you. Most of the users on Pinterest are women, and this network today is gathering more than 100 million active monthly users. Well-managed boards are the key to Pinterest. Interesting and attractive boards, containing cool places, for example, to be seen in your area of interest, is a super strategy to follow. Furthermore, think of exploring new ways of communication which Pinterest offers by creating “Pinterest Group Boards.” As a Real Estate agent what you should do is seek out and find a few group boards in the Real Estate niche that you can ask to become a member. Pinterest groups have a possibility to offer better visibility of your pins, raise the awareness of your pins, and get more traffic to your website. Let your pins be among the first ones. Last but not least, to make pinning from around the web easier, you can install the Pin It button as Google Chrome Extension or install it on whatever browser you have.